Philadelphia Daily News Assistant Managing Editor Wendy Warren, right, and Online Editor Vance Lehmkuhl are working on a Web site focusing on next year’s mayoral race. HELP WANTED: Fifth-largest city in nation seeks motivated cheerleader type for mayor. Must have strong team building, organizational, problem solving and interpersonal skills and be able to work with diverse groups of people to promote and develop the prosperity and social well-being of the city’s residents. Inspiring leadership, unquestioned integrity, knowledge of the issues, vision for the future and solutions for all of the city’s problems are preferred. 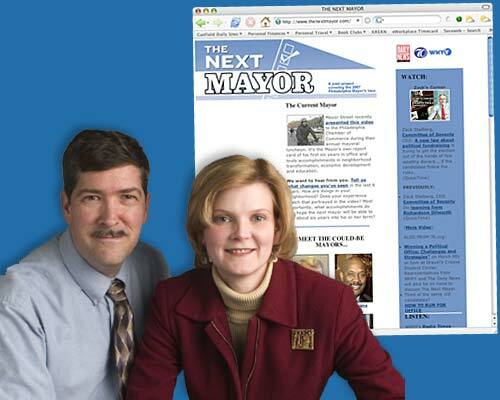 Thenextmayor.com is a partnership between the Daily News, WHYY public television and radio, and the Committee of Seventy, a good-government organization headed by former Daily News Executive Editor Zack Stalberg. The site is a multimedia collaboration that draws together Daily News stories, audio and video from WHYY, video commentaries by Stalberg and feedback from readers.